Grape Times Presents: Project GRAPEful 2018! The Grape Times blog has a tradition of counting down the days til Thanksgiving in grape style and this year is no exception. With so many frustrating and disappointing items in the news, we thought we’d take this opportunity to bring a little blessing to you this Thanksgiving season. We call it Project GRAPEful! While it’s so tempting (at this hectic time of year when tempers can run high and patience can run low) to gripe and complain, we would like to offer you a little hope so that all those frustrating or sad things can seem just a bit easier to deal with. Then invite others to do the same each day. We hope to start a Thanksgiving Blessing that spreads across the internet. So, whadaya say? 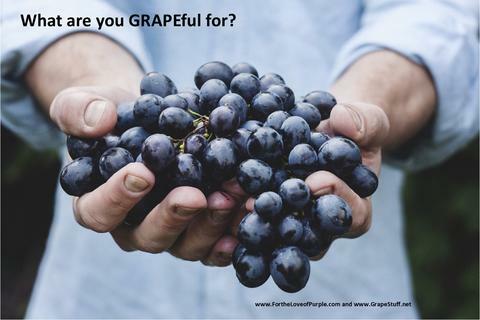 Are you in for #ProjectGrapeful?